Microlights offer a very affordable route into the world of light aviation. Try one of these microlight flights from a grass airfield near you and find out what your local area looks like from 1500ft. Don’t be fooled by the size or the speed of these aircraft – they’ve come along way since the pioneering days of earlier versions. 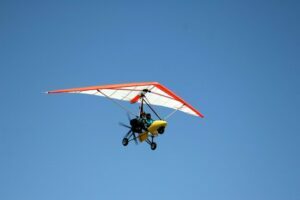 There are several types to choose from, but the one thing that designates them as microlights is that none of them exceed 450kg in weight (300kg for single seaters), so make enquiries using the links below and pick the one that sounds most exciting to you. The two main types of microlights are the flexwing and the three-axis machines. The flexwing varieties are those in which the pilot and passenger sit in a ‘trike’ (tricycle undercarriage and seats etc) under the wing, and the aircraft is controlled by weightshifting or ‘flexing’ by pushing and pulling on the control bar attached to the wing above. The three-axis machines look like conventional aircraft in that they have a fixed main wing, a rudder, and ailerons. These types often have the added benefit of an enclosed cockpit which gives the occupants more scope in terms of weather. Due to the combined weight restrictions of some of the flexwing aircraft, students who weigh over 100kg may find it difficult to find an instructor since there may be a limit of 200kg for the weight of the two occupants. Microlights come in many shapes and configurations. You can fly open or closed cockpit and a variety of wing types. This makes it a very attractive form of flying. Give the gift of wings or treat yourself. There are plenty of airfields around the UK offering microlight flights. Many are situated at smaller grass airstrips and away from the busier airfields. A full 60 minute microlight flight in twelve locations around the UK. Click here to find the ideal location near you. How about the Isle of Wight? There’s a microlight experience just for you at Sandown airfield.